Q1. Name and/or Known Alias? Rachel. Q2. First Mario game you played? Paper Mario. Q4. Favourite Power-up? Super Star. Q5. Least favourite Power-up? Blimp Fruit. Q6. Favourite Boss Battle? Ninja Koopa Brothers in Paper Mario. Q7. Least favourite Boss Battle? Bowser in Paper Mario: Sticker Star. Q14. Playing Mario alone, or with a friend? With a friend..
Family. I know that sounds corny, but I remember playing a lot of Mario with my family when I was younger. I grew up watching Kris play video games, but our oldest sister used to play with us once upon a time. We’d play Super Mario Bros. together as well as Mario Party and Mario Kart. My Mom and Dad would even occasionally play with us sometimes too. My uncle is a big gamer and now his kids are too. Kris and I got our other cousins into gaming as well and we play Mario Kart and Mario Party with them a lot. The games vary a lot between kart racing, board games, platformers, and RPGS that anyone can play them and have fun whether you’re alone or with friends/family. My most memorable Mario moment was when I beat Paper Mario for the first time. I always watched Kris play video games, especially if they were one-player. I had watched Kris play Paper Mario before and it easily became my favourite Mario game. It was a big deal when I tried playing it myself because it was rare I played games myself, but it’s an easy enough game. When I finally beat Bowser I was super excited that I played again. Paper Mario, to this day, is my favourite game and the game I’ve beaten myself the most times. I can play it over and over again. I’m looking forward to exploring New Donk City! I’m excited to see what Nintendo has come up with for this new Mario world. I’m also eager to try out the new mechanic with Mario’s hat. Transforming into other objects and beings certainly doesn’t seem like a “Mario” game to me, but I’m sure it it’ll be fun all the same. It’s definitely a cool idea. 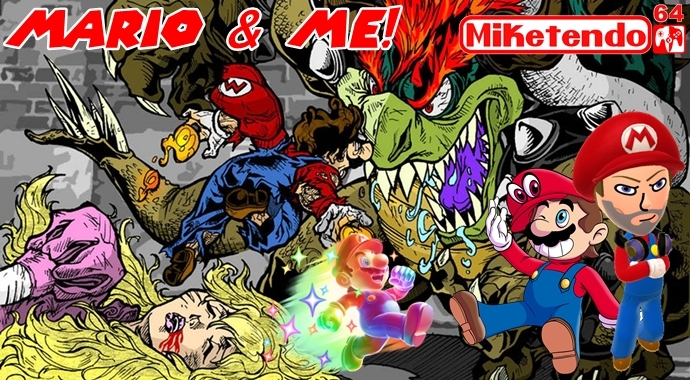 For more Double Jump does Mario & Me, the second interview will be posted very shortly and if you liked Rachel’s contribution, you’ll like Kris’ as well!